Last time I checked, "Zzzz..." (notice the round tag) denoted sleeping. 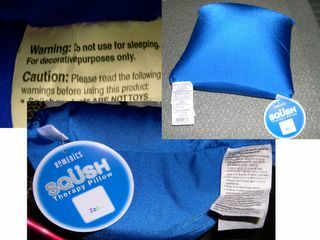 And yet, the #1 warning on this pillow is that is must NOT be used for sleeping. Go figure ... I plan to sleep on it tonight because that's why I bought it. I will keep you updated. Unless the reason they've told you to not sleep on it is because ....You'll diiieeee! Are you sure you want to risk it?